As we turn to Fall we’re discovering ways to warm up decor while still staying cool. 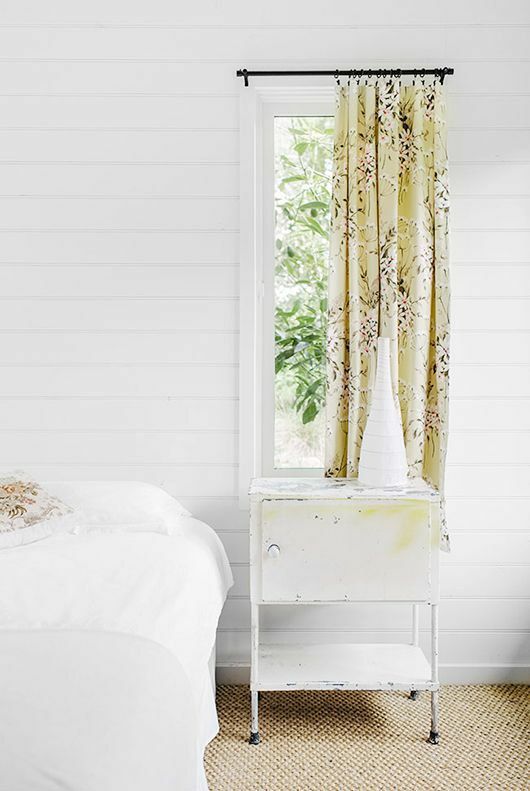 Floral curtains in light cotton fabrics are perfect for bedrooms. They still let the light in while softening the edges of window sills. Take a peek at our favorite window treatments in island and country styles. Handy with scissors and craft glue? 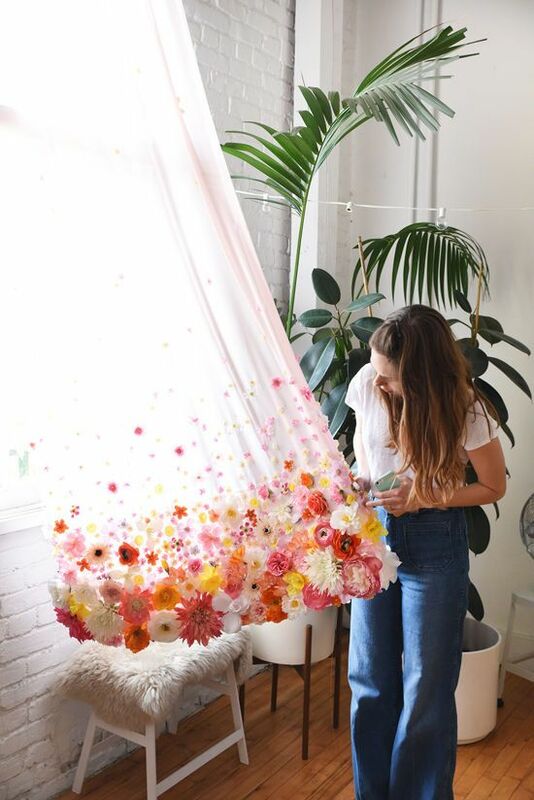 We are totally smitten by these easy floral curtains made with silk flowers. Cut off the stems, making the backs as flat as possible. Make sure you keep the plastic back in tact so you have a proper surface for glue. Go to designlovefest for complete instructions and more photos. Perfect project while you Netflix binge. Nicely done, girls! Another way to reduce the heaviness of curtains is to add tiebacks. We love Anthropologie’s delicate brass Phoebe tieback in bronze. So pretty with sheer white curtains. Another fun tieback idea you can make yourself with pom poms. 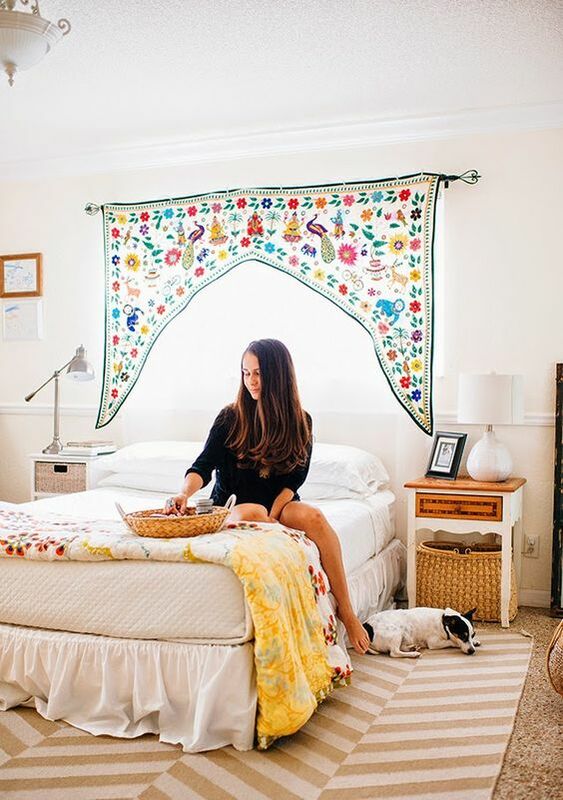 How cute is a string of pom poms anywhere in your bedroom? 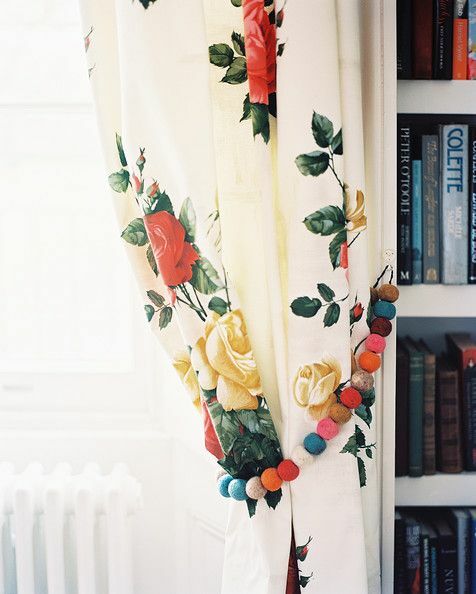 Match the colors of your pom poms to the print of your floral curtains to keep it cohesive. 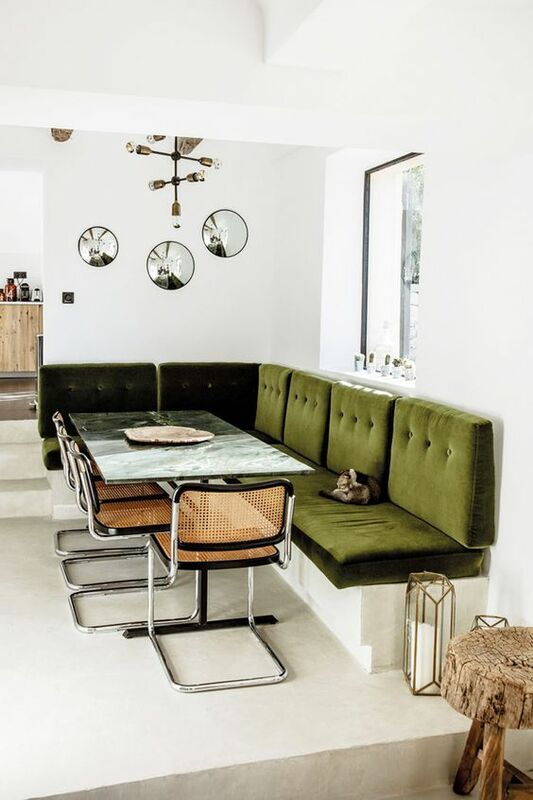 If you’ve got the minimal fever from our article last week, you can still do curtains. 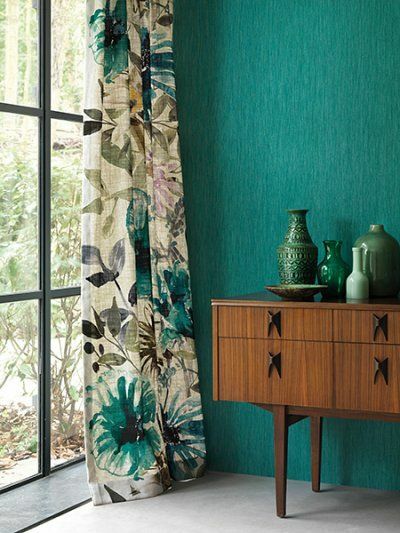 Find floral curtains in a delicate country print. Remember, less is more! We like this style in a shorter length as well. It keeps the look breezy and the floor area sparse. Simply hem a longer panel a few inches below your sill. Check out Bed, Bath & Beyond’s Cosette Sheer Window Panel for a nice, delicate print. If you insist on pushing your bed below a window, frame the head with a valance. 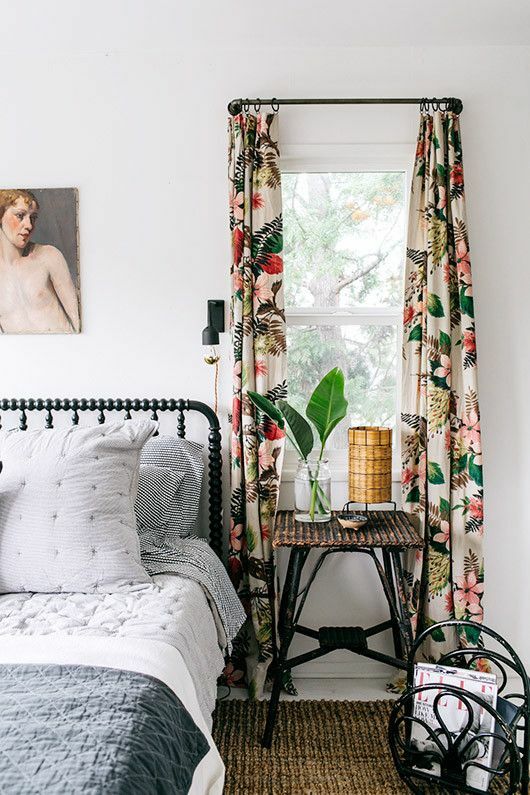 Bohemian floral curtains warm up a bedroom nicely, but they don’t require bulk. A valance draws the eye upward and gives a frame-less bed some drama. This is the kind of drama we welcome! We’re going to cheat a little bit on this next one. 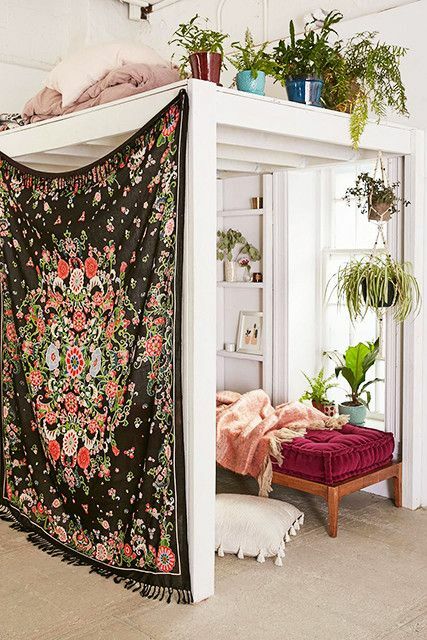 If you have a loft area, hang a tapestry as a stand-in for floral curtains. Instantly create a cozy reading nook and curl up with one of our favorite quick reads. 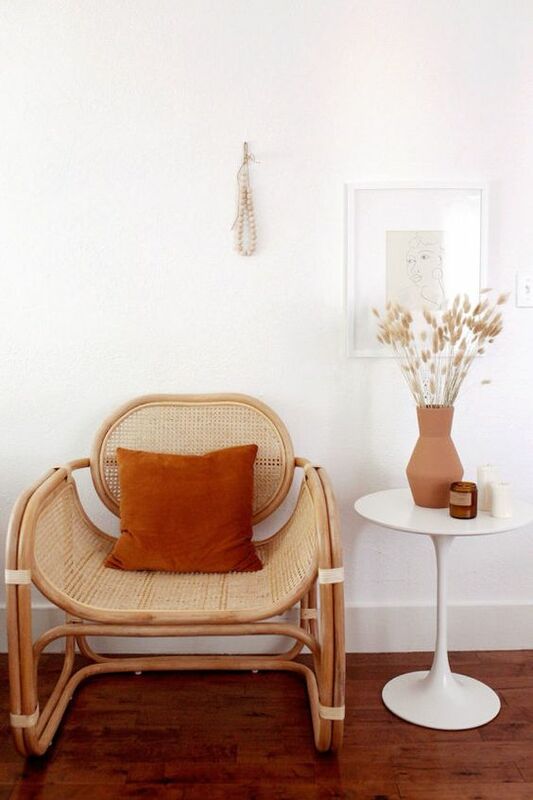 This is also a great meditation area, which we highly recommend creating in a bedroom environment. Urban Outfitters has a handful of tapestries to choose from with great ideas for hanging. Our favorite is the Grateful Dead Skeleton N’Roses Tapestry, but that’s just us. Also, since we’re talking bedrooms, it would be good to pull in a little Feng Shui. Check out our Feng Shui guide for enhancing love and relationships. Floral curtains in reds or pinks are a great way to encourage romance in the bedroom. 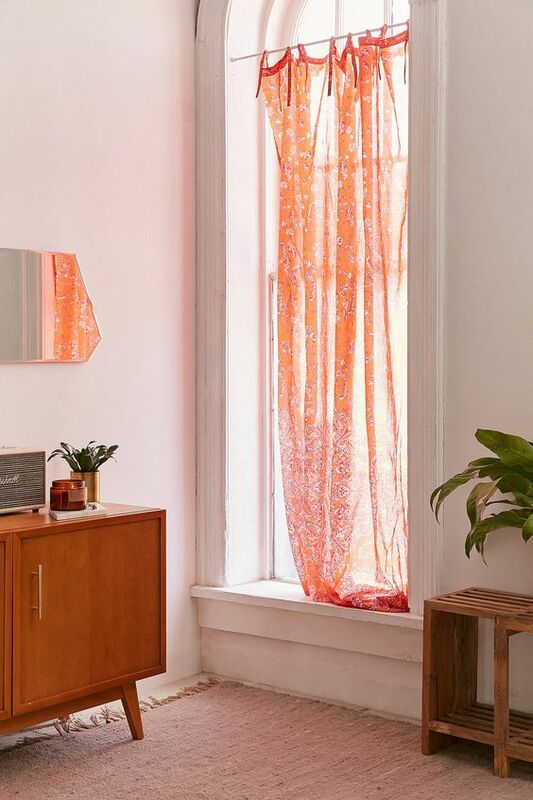 Add a breezy red panel like Urban Outfitter’s Lucy Boho Print Window Curtain to give the room a pinkish hue. We love the easy ties and the informal drag on the bottom. So romantic! 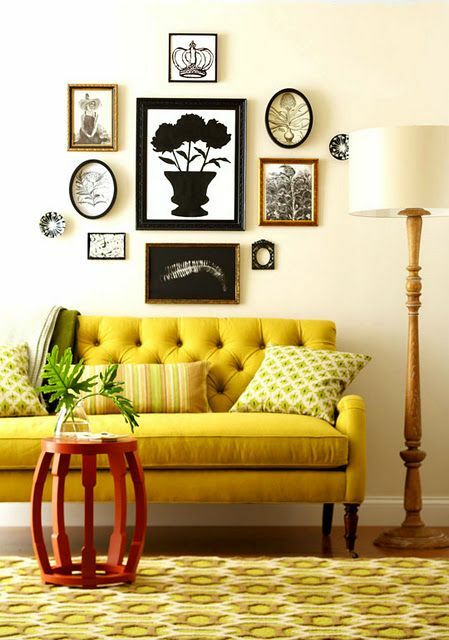 Whatever your decor style, a pair of floral panels can be a perfect post-Summer update. Feel free to be creative with your floral curtains. We love the easy DIY styles, which can also be accomplished with a tablecloth in your favorite print! Find the fabric you love and add clip-on drapery rings from Bed, Bath & Beyond. Stretch your imagination and give that window some flower power! Where did you find those tropical curtains from isn’t he 1st picture?